By Dr. Ernie Ward, DVM and founding contributor to IDEXX's Pet Health Network. Our dogs know our smell, and they love it. New scientific research proves that your fragrance is your dog's favorite. Neuroscientist Gregory Berns and his team at Emory University's Center for Neuropolicy used advanced brain-imaging to demonstrate dogs recognize scents even when the source isn't present. One of the most interesting findings of this latest study published in the January 2015 journal Behavioral Processes is how canine brains responded differently to the odor of unfamiliar dogs and humans compared to their own family. You are your dog's favorite smell. Berns has been studying the thinking of dogs for several years. He gained fame for being the first person to successfully train dogs to remain still during brain imaging and is developing scientific methods for determining if a dog is a good candidate for military or therapy service. He also penned the fascinating "How Dogs Love Us" using the latest neuroscience to explore how dogs think and love. His latest investigation involves canine cognition and olfaction. We've all experienced the powerful connection between a particular perfume and an emotion. Romance, home, work environments, and foods all involve scents and provoke specific feelings and memories. Berns wanted to examine how a dog thinks when smelling, especially because much of their sensory information is derived from odor. He told Jennifer Viegas of Discovery News: "Since dogs are so much more olfactory than humans, their responses would likely be even more powerful than the ones we might have." Because the source of the smell wasn't present during the testing, the study would also demonstrate sensory memory in dogs. The scents were obtained from highly odiferous body parts: the rear and genital areas of the dogs and the armpits of the humans. In addition, according to Viegas, participants were banned from bathing or using deodorant for 24 hours prior to sampling (pretty smelly science). According to the study, all five scents demonstrated activity in the part of the brain associated with positive expectations. This indicted that the dogs had some recollection and association with each aroma. The strongest emotional responses, those originating in the caudate nucleus, were reserved for scents from familiar humans, followed by the smell of known dogs. In other words, dogs favor family fragrances. 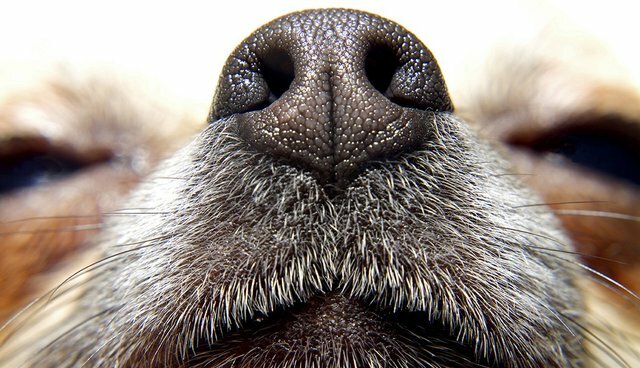 Dogs that had been trained as service or therapy dogs recorded the greatest responses to human smells. Viegas' article says this may be due to genetics (service dogs are selected because they possess these attributes or abilities) or perhaps due to stronger bonds created through prolonged training (more human interaction leads to greater recognition and positive feelings). "Not only did the dogs discriminate the familiar human scent from the others, they had a positive association with it. While we might expect that dogs should be highly tuned to the smell of other dogs, it seems that the 'reward response' is reserved for their humans. Whether this is based on food, play, innate genetic predisposition or something else remains an area for future investigation." In other words, dogs prefer the smell of pet parents over other pooches. They don't call man "dog's best friend" for nothing. What this study means for the future. Ultimately, scientific studies such as this will help better select better service dogs. Training dogs to detect explosives, sniff drugs, work in military or police settings, or serve as companions for physically and emotionally-challenged individuals is expensive. If a dog gets half-way through instruction only to find out it is not appropriate for the job, precious resources have been wasted. Berns believes brain scans of puppies may one day help us choose dogs best suited for specific tasks: "By understanding how dogs' brains work, we hope to find better methods to select and train them for these roles." Until then, I'm thrilled to find out my dogs' favorite smell is me.